The Amazon Medicine Dash Box is a special type of Medicine box with sensing capability of the medicine (pills) via sensors. The medicine box directly connect to the IoT cloud and stream the sensors data to the cloud. The Medicine Dash apps allows user to graphically visualize the sensors data (actually the remaining amount of the medicine/pills on a box) and provide push notification when the medicine is running low. Its also allows user to place order from Amazon by pressing a Dash button (clicking a button on the apps). The Amazon Machine box is a customize version cloud connected virtual Dash button with some sensing capabilities (future version of Amazon virtual dash buttons). Users can able to visualize the contents of remaining pills in a medicine box through this mobile application and place order by clicking order button (whether the button is connected to the Amazon dash service). The device always monitors its contains and notifies the users by invoking a push notification when the pills amount is running low. The mobile application also provide other notifications related to the order such as confirmation, shipping etc. Its also provides users to view Amazon's new products/offers via Amazon's ads. Users can connect more than one medicine box with this application. For demonstration purpose I place three different medicine box. (namely Prilosec, paracetamol etc). The device consists with array of sensors (Infra-red reflective) and a micro-controlled (I used linkit smart Dou) that reads the sensors data. Wireless connectivity features works as a bridge between device and the cloud. Suppose that, a sensor has two state HIGH and LOW. Assume that, the output of the sensor is HIGH when it detects any pill otherwise LOW. 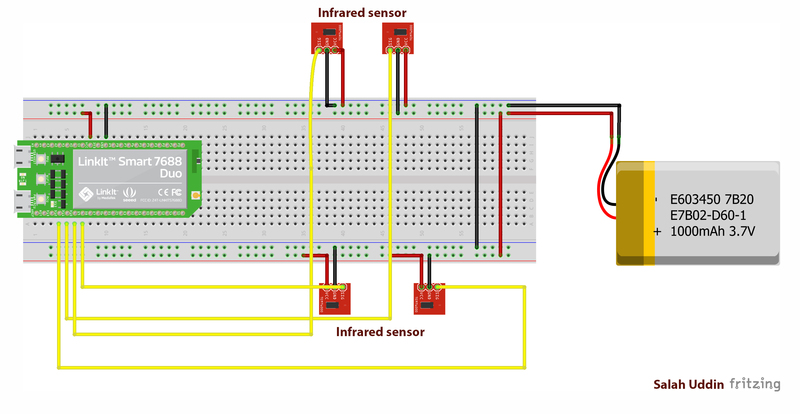 The Micro-controller unit collect the sensors data and using equation calculate the counter value and push the counter value to the cloud. For demonstration purpose thinger.io cloud platform is used in this project. The Dashboard shows the status of the medicine box in real time. when medicine is running low its automatically push a notification and users can order the medicine using the order button which acts as a amazon's virtual dash button. The order related notifications (order confirmation, shipping etc.) are also shown through the apps as a push notification. The apps also recommends users for buying other goods from Amazon as well. This type of device is helpful for elderly person who lives alone. Since the device is cloud connected as a result the family members may help their fathers/mothers by purchasing their medicine before running out. There is a possibility to extend this system for ordering some others goods and services. Another possible application of this device is pill reminder (on time) as well. I have used three gauge (medicine), only one gauge is connected to the device via cloud, others are showing some random value. Push notification is automatically invoked when medicine is running low and when user clicked the order button (Dash). The medicine company packed their medicine with this device and Amazon only sell this modified version of medicine pack. There must be a agreement between Amazon and medicine companies. #define USERNAME "YOUR USER NAME"
#define DEVICE_ID "YOUR DEVICE NAME"